I’ve noticed today that newly installed server over at the “NorthShore News” newspaper is having same problems as Parksville’s server had couple of weeks ago. Some users loose their permissions to some folders. 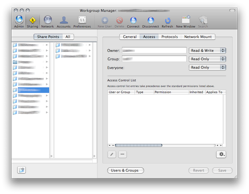 ALS were initially enabled on shared volumes but browsing through WorkGroup Manager shows that there is nothing in those preferences. Trying to add user or group is not working either. As I mentioned, it happened couple of weeks ago at Parksville’s “OceanSide Star” newspaper couple of weeks ago. At that time I thought that ALS was never setup, and was ready to rebuild the server. Quit ANY AND ALL management apps (Server Manager, Workgroup Manager) both on the server itself and any connections from any client/management workstation(s). Please double and triple-check your typing, do NOT make any typos and do NOT skip the back-ticks below, that is the: ` character. It does help if you have ‘grayed out’ Sharing in the WGM as well. 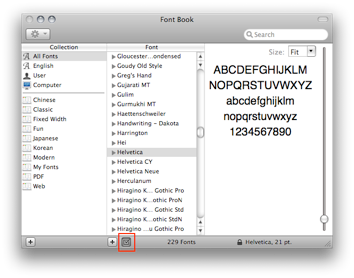 Font Reserve is great Font management software, but every now and then you might experience font problems. Main reason for that is font caches. According to Extensis, font caches have to be purged on regular basis. They do not supply any tools, so you have to do it manually. When you get last error message in this list: “DocFontInfo::DoActivate – exception caught # (1)” it means that Font Reserve is getting corrupted. Usually none of the symptoms are present after that error message and everything seems to work fine until Font Reserve stops working at all. So, when you get “DocFontInfo…” error message, it is a good practice to clean Font Reserve preferences. Here is how. 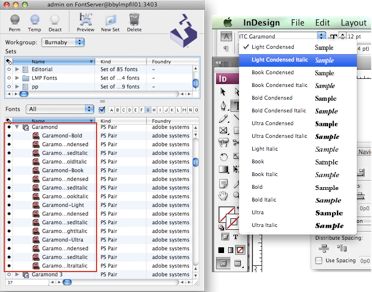 Quit all Adobe applications (InDesign, Photoshop, Illustrator, Acrobat, Distiller), quit Safari. 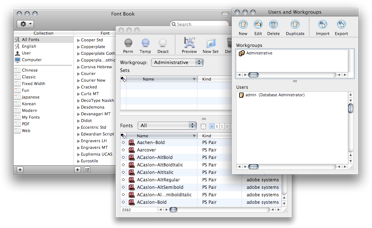 Open System Preferences from Apple menu and choose Font Reserve. Uncheck “Turn on when log in” checkbox. 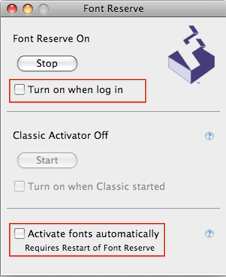 Click on “Stop” button to stop FontReserve and make sure it says “Font Reserve Off”. Close this window and System Preferences window. Navigate to Macintosh HD/Library/Application Support/Font Reserve/ and delete folders Databases and Trash. Navigate to your Home Folder/Library/Preferences/Font Reserve/ and delete all files from it. Empty trash. 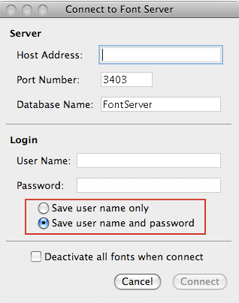 All your FontReserve preferences, such as server to connect to, login name and password, Font display in Font Reserve Client would be gone. 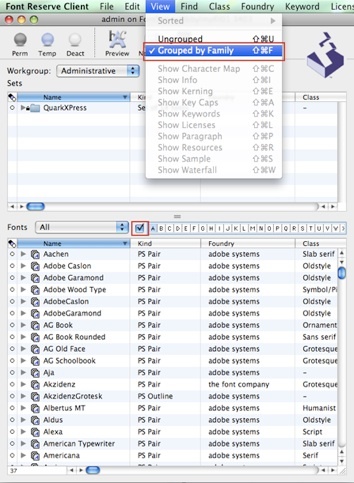 Open System Preferences from Apple menu and choose Font Reserve. Check “Turn on when log in” checkbox. Click on “Start” button to start FontReserve and make sure it says “Font Reserve On”. Launch Font Reserve Client, and connect to Font Reserve server using your own username and password. 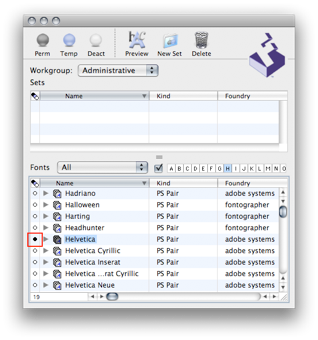 Contact your supervisor to get a host name for your Font Reserve Server. Make sure to check ‘Save user name and password’ to save your login information.